Predicting Next Season: Heavy Run Game? 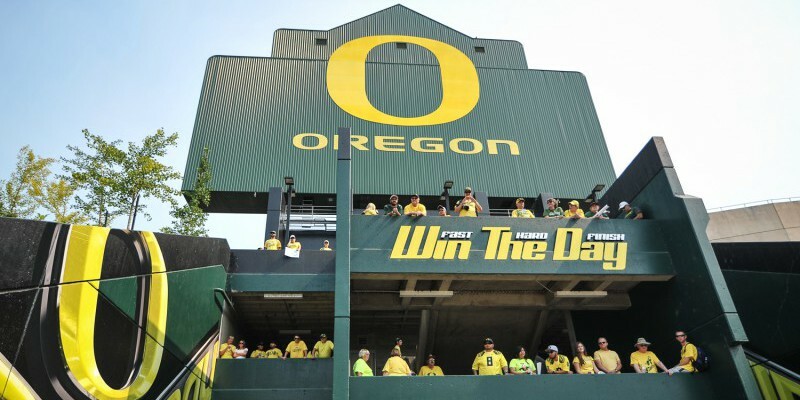 While everyone, myself included, loves to speculate about who the next QB will be now that Marcus Mariota has left, there is one very important truth we must remember; Oregon is a run oriented team. Yes, having a great QB this season certainly helped, but Oregon’s offense always goes through the run. The good news is, since the run game is more important for Oregon, the loss of a QB isn’t as problematic. 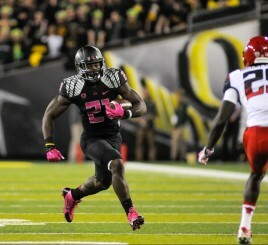 On top of this Oregon has a pretty potent stable of backs already on the roster. With Royce Freeman, Thomas Tyner, and Byron Marshall in house, Oregon is poised to have one of the strongest run games in college football, again. All three of these RBs are very versatile football players, with Marshall essentially playing WR this past season, and even taking snaps as a wildcat QB in the past. Along with this, he has been at every position on option plays, and even been the bubble screen receiver on packaged plays. And should Oregon has somebody come out of nowhere and be an amazing QB again, Marshall has shown he can adapt to either a run heavy or pass heavy style of offense, running for over 1,000 yards in 2013 and then having over 1,000 yards receiving in 2014. Freeman on the other hand is a more of a typical power back, being deadly up the middle and between the tackles. But don’t let that moniker fool you, much like Arian Foster, Freeman makes up for not being a speed runner by having good vision and being able to cut quickly. 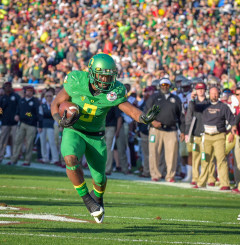 After rushing for 1,300 yards in 2014, some are saying Freeman could be a Heisman candidate in 2015, especially if Oregon has a renewed emphasis on the run. Tyner is perhaps the most perplexing of the group, despite running a 4.30 40 time coming out of high school, Tyner does tend to run well inside the tackles. While he is not the bruiser that Freeman is, he is just as deadly running inside the tackles or outside. Despite his skills, he hasn’t lived up to his ability, partially because of injuries. For my money, Tyner has the highest ceiling of the three backs, but also the lowest floor. Next year could be a particularly strong year for Oregon’s run game, especially without the kind of prolific passer they had this year. The silver lining in the loss of Marcus Mariota may very well be the re emergence of Oregon’s run game and the Heisman Candidacy of one of their our talented RBs.